Seven intriguing 3-D forms are featured prominently in this modular necklace. Invisible magnetic findings make it easy to change the length to suit the wearer's neckline or fancy. Learn to make these forms that develop in a most intriguing way from a circular peyote start. Connect adjacent forms using an original stitch that provides suppleness while assuring that the forms lay correctly. 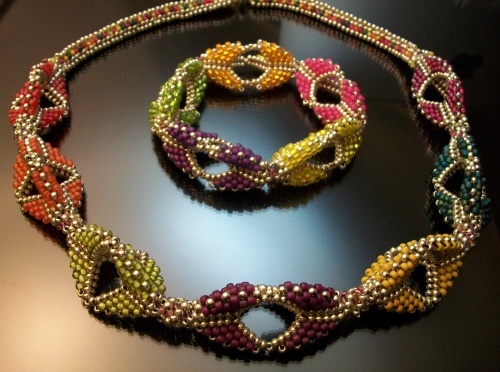 Learn polygon stitch to create a three-sided rope to finish the necklace.